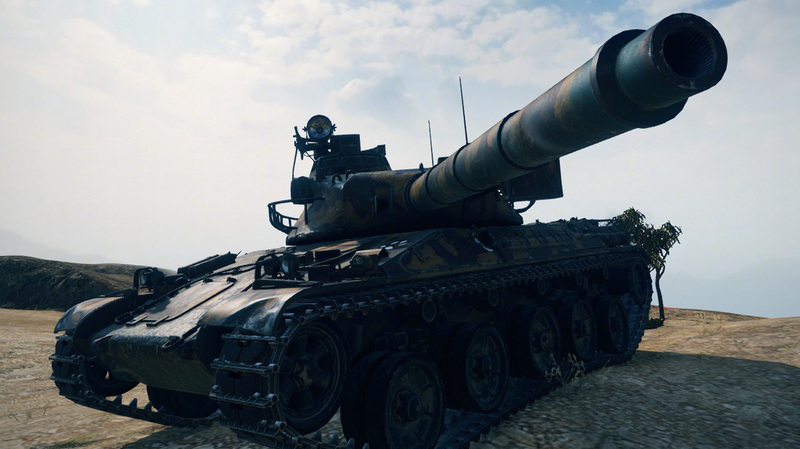 A huge amount of content came with the latest update (patch 9.10) to World of Tanks: new map restrictions based on tank tiers, 20 new HD models, and the newly-revised “Rampage” mode (with respawns and free-for-alls). 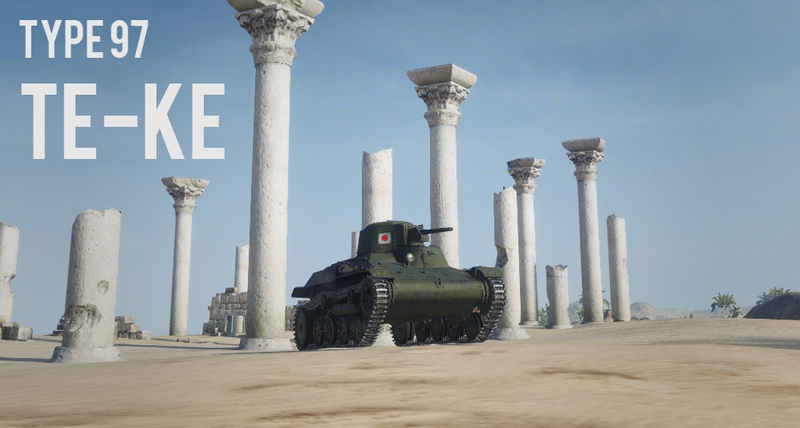 Most importantly, another new (and very substantial) branch of vehicles has arrived: the Japanese heavy tanks. You can think of it an entire line of Mäuse (Mauses? Meese? Mice? Whatever, you get the point)... or can you? To answer that question, I ground out the line up to the tier 9 and tested each tank fairly extensively. Time for a mega review! Well... you’ve gotta start somewhere. There isn’t too much to say about this tank: it’s slow, has basically no armor (17mm at most) and crap mobility (9.19hp/ton), with a less-than-ideal 57mm gun (29mm AP pen, 55mm HEAT pen, .4 accuracy, 75 damage per shot). The only redeeming points for this tank are its fantastic gun depression (-15 degrees, one of the best in the game), high damage per shot (95 with HE, 75 with AP), and large health pool (200 hitpoints). Definitely a “meh” tank. The Type 91 is rather unique in that it’s the first and only tier 3 heavy tank in the game. So, does it have absurdly high armor values, even rivaling tier 4 heavies? Nope, it’s got 20mm of armor at the best (worse than the French light tanks!). What about a big, derpy gun? Another nope; it’s got a 47mm rapid-firing gun (which I’ll talk about later). Okay, so does it have a massive health pool to compensate? Well... no, unless you consider 250 health to be a lot for a tier 3 (keep in mind, the Cruiser IV light tank has 240). It does retain one heavy characteristic, however: it’s slow. REALLY slow. Despite only weighing 20 tons, it only manages a power-to-weight ratio of 12.44hp/ton, and it’s limited to a top speed of 25kph, making it one of the slowest (and least flexible) tier 3 vehicles in the game. It does have some redeeming points, however: firstly, it gets -12 degrees of gun depression, allowing it to peek the low-profile turret over hills while hiding most of the hull (although, make sure you don’t try to aim over the mini-turret on the front, as that causes the gun to bump upwards significantly). Secondly, it gets a fantastic gun for tier 3: the high-penetration 47mm gun from the Type 97 Chi-Ha (81 AP pen, 122 premium pen, 70 damage per shot), but with a slightly increased rate of fire and better accuracy. Overall, I did like this tank a lot more than the Type 89, but it can see tier 5s, which doesn’t end very well due to the terrible mobility and paper armor. You’d think there wouldn’t be much good about another tier 4 heavy (both the DW2 and B1 are huge letdowns), but this tank is surprisingly effective. While it still doesn’t have any armor (35mm at the most) or speed (9.92hp/ton, 25kph top speed), it gets an impressive hitpoint pool (430 hitpoints) and a high-damage 75mm gun with 70 pen (not as bad as it sounds, especially since you can fire 100-pen HEAT rounds if necessary) and a weirdly-high rate of fire (110 damage every ~3.3sec with a gun rammer). The gun can be a bit hit-and-miss at times (literally; it’s not very accurate and it has low shell velocity), but if you can get up close to the enemy and use the full -10 degrees of gun depression (and the small turret, for that matter), this tank can be pretty effective against tier 4s and 5s (although, don’t expect to pen any tier 5 heavies from the front with AP). Oh, and since it’s a tier 4 heavy, it gets preferential matchmaking (as in, it only sees tiers 3-5). While this tank isn’t all that great on paper, it can pull its own weight (literally), especially when top tier. This is where things start to get interesting (if they weren’t already). The title of the largest tier 5 tank used to belong to the Pz.Sfl.IVc (aka the “FlakBus” or “Toaster”), but now, the O-I Experimental has stolen its crown. 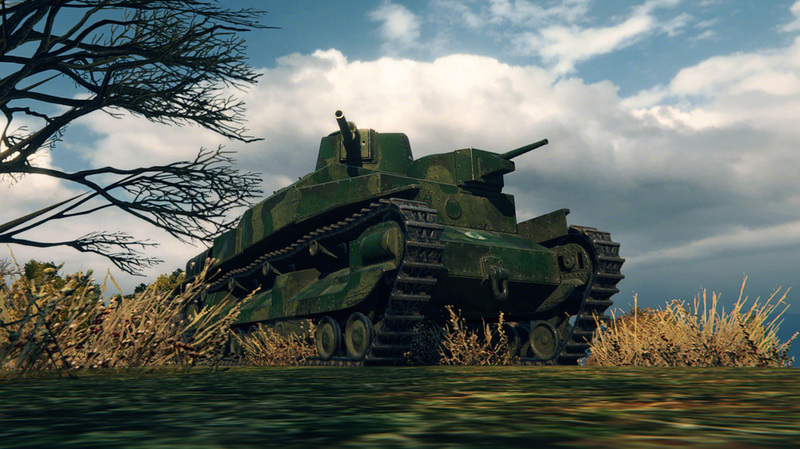 In fact, the O-I Experimental is actually larger than most tier 6 and 7 tanks, rivaling the KV-3 in height, width, and length. 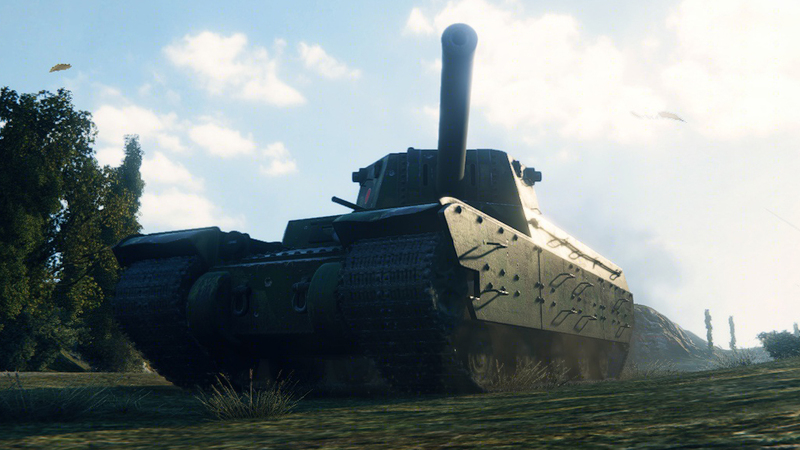 It’s also the heaviest vehicle in the tier, weighing in at just over 100 tons (60 tons heavier than the Churchill I and 51 tons heavier than the KV-1). Now, with this much weight, you’d expect the tank to rival a TOG’s speed (or lack thereof). Wrong! Not only does this thing have the highest top speed of any tier 5 heavy (40kph), but it also has the largest engine (1200hp) and a decently-high power-to-weight ratio of 12hp/ton. How about the gun selection? It’s gotta be pretty bad considering the strengths of this tank, right? Wrong again! It gets to choose between a 120mm derp gun (stock), the Chi-Nu’s top 75mm gun with an increased rate of fire, or a very punchy 105mm gun with 300 damage per shot, an 8.5sec reload, and 130mm of standard AP penetration. Personally, I’d recommend the 105mm gun, as it packs quite the punch for a tier 5, and can catch quite a few tanks off-guard (especially in tier 7, where you can put the surprising speed to use for flanking fire). At this point, you’re probably thinking, “there’s gotta be something weak about this tank (besides the size)! The armor MUST be bad!” Well... surprisingly, it isn’t all too terrible. The front and rear of the hull and turret form are almost-uniformly 75mm thick, while the side of the hull is 70mm thick. Even the miniturrets (which, knowing the nature of the KV-5, you’d expect to be weakspots) are the same thickness as the rest of the hull (75mm thick). This allows you to sidescrape and over-angle (to a degree) around corners, but it still isn’t quite impenetrable to tier 5 heavies. Overall, this is definitely a keeper for me, as it makes for a fantastically-fun tier 5 heavy tank. If you thought the tier 5 was interesting, the tier 6 is even more so. 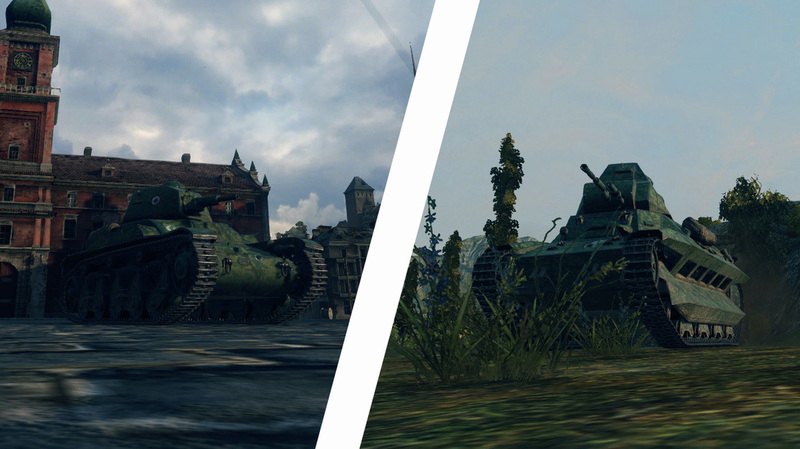 Despite their similar appearances, however, the two tanks are fundamentally different. For starters, whereas the O-I had a good top speed and decent power-to-weight, this behemoth has a claimed 29kph top speed, which it can barely even reach on flat ground (let alone uphill). For that matter, it has the second-lowest power-to-weight ratio of any tier 6 tank (only the TOG II is slower) - 7.89hp/ton with my equipment setup (large gun rammer, gun laying drive, and superheavy spall liner). Why did the weight increase so much, you ask? Well, the armor was doubled on both the front and rear (150mm on both). Even the miniturrets changed in appearance - now, they’re miniature versions of the main turret - and the armor was increased to match (150mm again), so they aren’t weakspots. Or... are they? Well, if you angle the tank, both the upper and lower glacis become angled; however, the cheeks of the miniturrets become flat (and therefore, they’re easier to pen). Still, this isn’t a huge issue, as the cheeks are still 150mm thick, making them tricky to pen for almost any tier 6 (and some tier 7s). The gun selection is updated as well, with the tier 5’s 100mm as the stock gun (with higher penetration, but a slower reload) and a 150mm derp gun (similar to the KV-2’s) as the top gun, with 75mm of HE pen and 900 alpha damage. This is a fitting gun for this tank, as, unlike the KV-2, you can pop out, aim, take your shot, and pull back to reload for 21 seconds while taking minimal damage due to the immense armor. Three major things bog this tank down (besides the speed), however: it’s very artillery-prone (as it’s the size of a Maus), the sides are still the same-old 70mm (and now, there’s a 35mm weakspot on the sides behind the tracks and under the miniturrets), and the gun depression over the miniturrets and sides is not enough to deal with most tanks at brawling range. Most lights, mediums, and heavies from tier 4 to 8 can get up right next to this thing and shoot it multiple times, while it can’t respond due to how high up the gun is mounted. This tank was another fantastic machine, but its speed and gun height limited its performance heavily. This tank was honestly a huge letdown (pun intended) for me at first, especially after playing the tier 6. To start, whereas the O-I had a heavy sloped section of armor on the lower glacis (which lead to some tier 8 heavies bouncing off the front of it), the O-Ni’s armor is barely sloped. Yes, it’s 175mm thick, but most tier 7 heavies can penetrate it frontally while unangled (and don’t even get me started on gold ammo). Why not angle, then? Well, there’s one huge weakspot that causes a lot of problems for this tank: the armor behind the lower portion of spaced side armor (and tracks) is only 35mm thick, and if you attempt to angle the tank (even slightly), enemies can shoot the front drive wheel and (usually) do damage through this 35mm section (even while angled, it’s an overmatch zone for most tier 7 guns). I’ve had KV-1s penning my front due to this huge weakspot, which is far less than ideal (as you can probably imagine). Also, the mini-turrets have only 150mm of armor on the cheeks and sides, making them easier to penetrate than the rest of the armor. Even though it regains some acceleration (11.66hp/ton) the top speed is decreased to 25kph, making it far less flexible than the tier 5 (or even the tier 6, in some cases). Oh, and guess what? It’s officially the largest tank in the game (taller and longer than both the E100 and Maus), which only amplifies the weaknesses of the tank. Oh boy, this was hard to get used to, especially in tier 8 and 9 matches, where it’s almost impossible to hide. In the perfect matchup when this tank is top tier and facing enemies that can’t pen its front or rear, this tank is an absolute beast: I’ve had several 3,300 damage games where I blocked between 5,000 and 7,000 damage with the O-Ni’s armor. However, these monster games are few and far between, as most of the time, you’ll find yourself being damaged through the weakspots (or just through the mostly-flat armor), unable to return fire due to the terrible gun handling and iffy accuracy. I’d have to say that this tank is probably my second least favorite one in the entire line so far (besides the tier 2), but it can work in certain situations. O-Ho (O-I 120t) | To derp, or not to derp? ​Wow. This tank is a huge relief (again, pun intended) after the tier 7. With improved armor, far better gun characteristics, and a larger health pool, this tank fairs a lot better under normal circumstances than the previous tank. Firstly, the armor has been upped to 200mm at the front (which is very helpful) but, most importantly, the side armor is increased to 105mm, which allows you to sidescrape much more effectively than the tier 6 or 7. Also, the armor behind the tracks has been doubled from 35mm to 70mm, which removes one of the biggest weaknesses from the previous tank. To add to this, the hitpoint pool got a bump of 150 hitpoints, allowing this tank to take more shots before going down. As for the guns, they don’t actually differ too much from the tier 7’s... and yet, they’re far better. Why? To start, you get an “improved” version of the 105mm gun, with far better DPM (the highest of any tier 8 heavy, in fact - it reloads in just 8.03 seconds with a gun rammer) and the old gun’s premium rounds as standard ammunition (at a decreased price). However, several things haven’t changed: the gun dispersion is still terrible, the aim time is still long, the accuracy is still just as bad (.42), and the damage per shot is still rather low (for a tier 8 heavy, at least). Another problem is introduced on this gun: the lack of premium ammunition. 215mm of penetration certainly isn’t bad for a standard AP round on a tier 8 heavy; however, it definitely starts to struggle against tier 9 and 10 heavy tanks, so the lack of a premium round limits its ability. Personally, I didn’t like this gun very much when using it due to the poor accuracy (again) and lack of a premium round (for tier 9 and 10 matches). On the other hand, the 150mm howitzer that made an appearance on both the tier 6 and 7 comes back on this tank, but with a greatly-improved rate of fire (14.671 reload! ), somewhat-better accuracy (.54, so it’s still pretty bad), and a slightly-improved aim time (3.3 seconds). While driving this tank, I found this gun to be the most fun, as you have a chance to do 910 damage in one hit with HE ammo, which was very useful against tanks like the German Waffentrager series or those pesky scouts. Additionally, you’re almost always guaranteed to do damage with every hit (unless you are unfortunate enough to hit the tip of an enemy tank’s gun barrel or are shooting at a very strongly-armored target i.e. T95s), so you don’t have to aim for weakspots on tier 9 and 10 heavy tanks if you’re in a tricky situation - however, aiming for these weakspots is still suggested, as you’ll do more damage to thinner armor. One problem arises concerning all of the guns, however. Take note the position of the miniturrets on the front. See how one of them is right in the middle, and the other one is to the left? These two miniturrets limit the gun depression (from -10 to around -3), and, considering how high up the gun is mounted, you almost always have to keep your gun away from these two miniturrets when firing at an enemy tank. In some ways, this is more of a blessing than a curse, as you are almost forced to angle to use the gun depression properly, and if you aim the gun over the right side (and angle your tank to match), the armor becomes almost perfectly angled against incoming fire. So, a heavy tank with immense armor, a hilarious derp gun, and gun depression limits that practically force you to angle? Definitely two thumbs up for me. I’m really not sure what to think about this one. On paper, it seems like an epic tank, but in reality, it gets stomped into the ground in many situations. To start, it has 250mm of frontal armor on the hull and 270mm on the front of the turret; however, it’s pretty much completely flat, so angling is necessary against most other 9 tanks. Also, it has two cheeks on the front (like the Tiger P) that are only 200mm, so if you angle the tank incorrectly, enemies can shoot into them and do damage most of the time. The gun is also epic on paper: it’s a 140mm naval cannon with 600 damage and 249mm of standard penetration; however, it has mediocre accuracy (.42 dispersion at 100m) and a very long reload (just under 18sec with a gun rammer). The long reload presents one of the many issues of this tank: as soon as you fire, most enemies you face can put around 2-3 shots into you for every shot from your 140mm gun. This, along with the flat armor, brings another issue to light: gold spam. 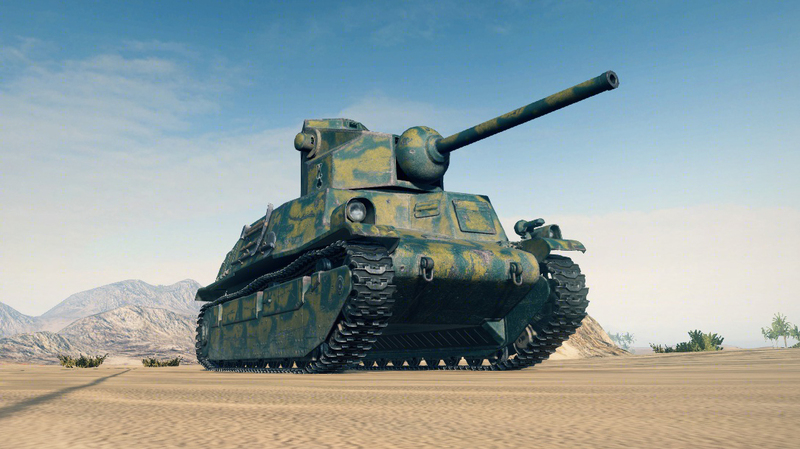 The Type 4 relies heavily on its armor; however, most tier 9-10 tanks fire gold ammunition with upwards of 300 penetration, rendering the armor nearly-useless at all but the most extreme angles - and trust me, almost everything loads gold upon seeing and/or bouncing off the Type 4, even high-pen tank destroyers like the T110E4 and Jagdpanzer E100. Combined with the fact that the tank has less than 8hp/ton and struggles to hit its top speed of 20kmh, your experience in the tank is almost solely-dependant on whether or not the enemy chooses to fire gold at you (or if the enemy artillery focuses on you - which they will 99% of the time, as you’re very easy to hit). If you happen to run into a group of tanks who don’t fire gold at you, this tank can be nearly invincible (from the front, at least), but if you run into a group of gold-shooting tanks (which happens most of the time), you’re pretty much screwed. To add to all this, you have to choose your position carefully, as your speed limits you quite a bit: if you happen to go where everyone else on the team decides to go, you may not even have the chance to get one shot off, but, at the same time, if you happen to go where your team doesn’t, you can expect to be quickly overwhelmed by the enemy tanks and destroyed before you can even fire a second shot. Besides the gold-spam (and the attention from artillery) this tank attracts, this is the main reason why I don’t like this tank as much as I want to. It depends too much on the team to work in a game like World of Tanks (and for understandable reasons). From the pictures, you’d think these two tanks are pretty much the exact same thing. Right? Well... again, not so much. Despite looking so similar, there are quite a few reasons why I’m looking forward to driving the Type 5 Heavy, as it appears to improve upon almost all of the problems I had with the Type 4 (at least, on paper). To start, the accuracy is improved from .42 to .4, and the reload gets about 2-to-3 seconds faster (15.27sec with a gun rammer and a 100% crew). The aim time also dropped by about half a second, reducing (in theory) the tank’s exposure time. As for the armor, it gets bumped up from 250mm on the Type 4 to 260mm on the Type 5, with 280mm (!) on the front of the turret (up from 270mm on the Type 4). This means that your survivability against tier 10s (and gold shells, for that matter) is somewhat improved, especially when angling. The tank also gains an additional 750 health over the Type 4, making it the second most durable tank (as far as hitpoints are concerned) at tier 10. Additionally, the tank sheds 10 tons of weight off, allowing for slightly faster acceleration (although not by much), and the top speed gets a 5kph boost, allowing the tank to keep up decently-well with the likes of the E100 and Maus. So, this thing looks pretty promising (at least, on paper). We’ll just have to wait and see, I guess. So, there you have it! Thanks for reading, and I hope you all enjoyed reading the review (and maybe even found it useful in deciding whether or not to grind down the line). As some of you may have noticed, the 70th anniversary of Victory Day (May 9th, 1945) came around just 2 weeks ago. 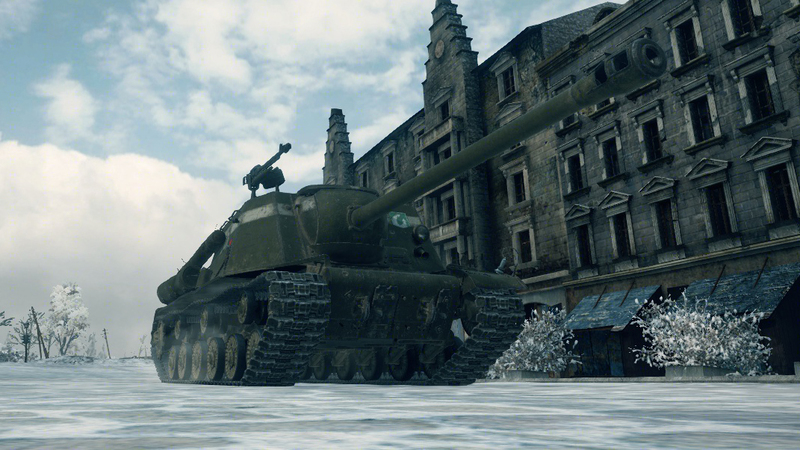 In response, Wargaming released a set of 4 tanks, named the “Berlin Quartet”, to commemorate the historical event: The T-34-85 “Rudy”, Cromwell Berlin, ISU-122S, and IS-2. In this article, I’ll be taking an in-depth look at each vehicle in-game. So, let’s start (somewhat) small. The first of the Berlin Quartet tanks, the T-34-85 “Rudy”, is a tier 6 medium tank based off the T-34-85 used in the Polish TV series called Czterej pancerni i pies (“4 tankers and dog”). It is pretty much identical to the non-premium T-34-85 already in game: it has pretty terrible armor (45mm at the front isn’t much for a tier 6), but it has good acceleration, maneuverability, and a fantastic 85mm gun. However, unlike the existing T-34-85, the “Rudy” has 100 less engine power (500hp vs 600hp), which reduces its power to weight ratio slightly (15.45 hp/ton vs 17.83hp/ton). Happily, the Rudy has better traverse speed (42 vs. 38) and slightly improved terrain resistance, which makes the tank about as fast as its non-premium counterpart. Also, despite the gun being labeled “85mm S-53” which is the stock gun on the T-34-85, the gun is statistically identical to the 85mm D5T-85BM on the T-34-85. So, overall, it’s just a T-34-85 that makes more credits and XP. That Brothers-In-Arms crew it comes with makes for a nice bonus, too. Oh, and it wouldn’t be complete without the dog: not only does the dog (Szarik) replace the radioman as a crew member, but if you have the Sixth Sense crew perk on your commander, he barks every time you get spotted. It certainly gives the tank that extra bit of character! 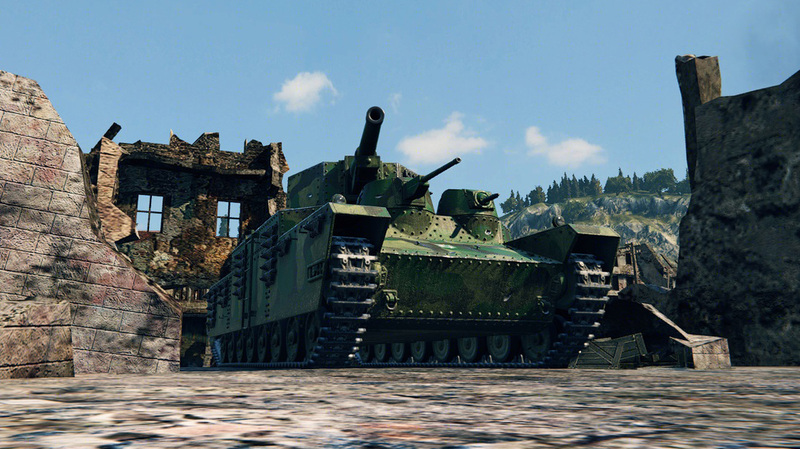 Next up, we have the Cromwell Berlin. 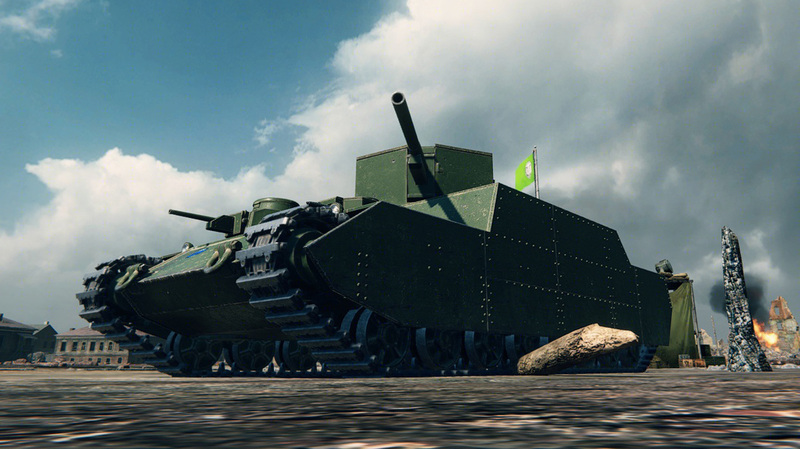 This is another tier 6 medium tank, but this time, it’s a British one. 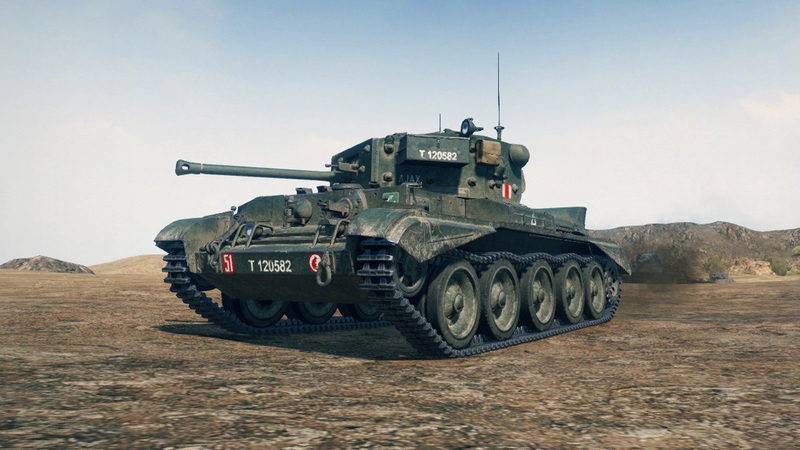 Once again, this tank is quite similar to its non-premium brother, the Cromwell: it has the same gun, same acceleration, and similarly terrible armor. 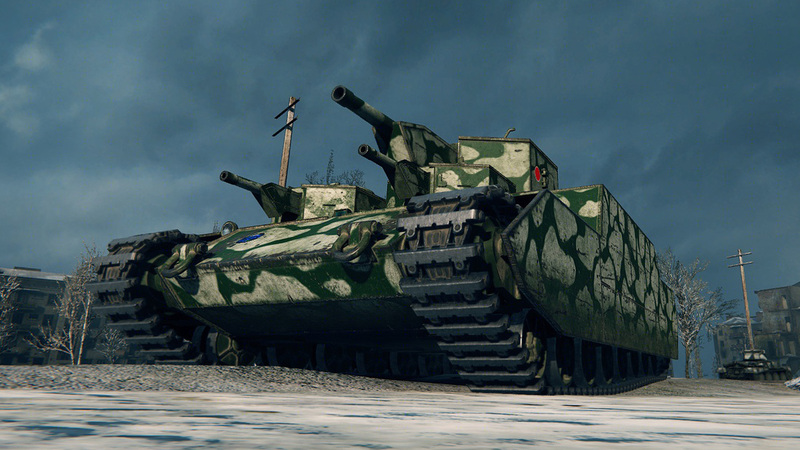 However, this thing has a few differences when put side-by-side with the Cromwell as well, although these actually benefit the performance of the tank quite nicely. To start, one of the main complaints I had about the regular Cromwell was that its traverse speed was fairly low (36 deg/sec) when taking into consideration its turret traverse and acceleration. 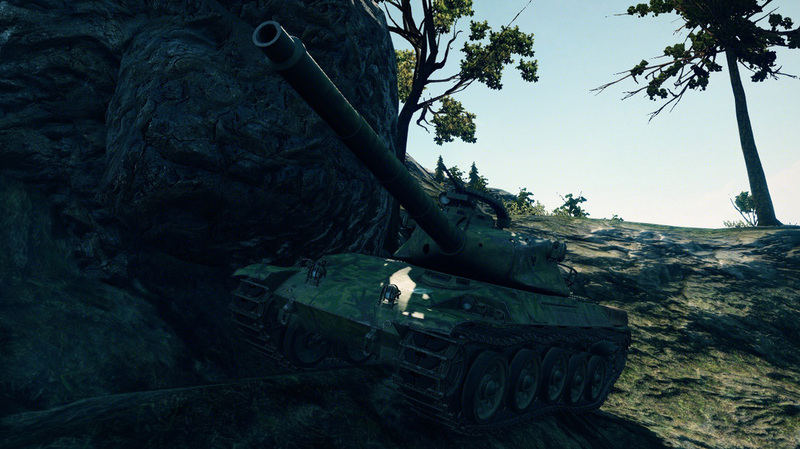 Somehow, the Cromwell Berlin fixes this problem completely: the tank has a 50 deg/sec traverse speed! Additionally, the terrain resistance is almost half of the regular Cromwell’s, meaning that this thing handles and accelerates very well on-and-off-road. Similarly to the Rudy, this tank’s gun is listed as the stock 75mm from the Cromwell; however, it is statistically identical to that of the Cromwell’s top 75mm HV gun. Strangely, this tank actually has slightly better armor when compared to its non-premium counterpart, though: the side armor on both the hull and turret is slightly thicker, which gives it better protection against High Explosive shells. And once again, the Brothers-in-Arms crew increases this tank’s potential even further. This is definitely my favorite tank out of the pack due to the high rate-of-fire (and damage per minute), surprisingly good accuracy, incredible speed, and slightly improved protection from HE ammo. 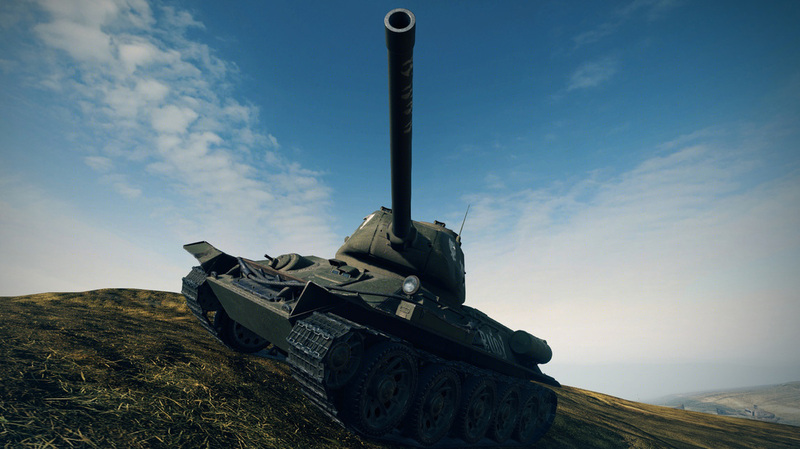 Thirdly, we have a tier 7 Russian tank destroyer: the ISU-122S. This tank is a bit more peculiar than the others so far: other than the fact that it’s a tank destroyer and not a medium, it takes a tier 8 platform (ISU-152), bumps it down a tier (and lowers its hitpoints, sadly), and gives it a 122mm D-25S gun similar to that of the IS-1’s topmost 122mm gun. However, unlike the IS-1, this thing doesn’t have the armor, hitpoints, or turret. Happily, there’s a balancing factor: the 122 on this tank destroyer has an incredibly high rate of fire & DPM (3.7k with a gun rammer and vents) and improved accuracy when compared to the IS-1 (although it’s still a little wonky at times). Also, as with the tier 8 ISU-152, this tank has a very trollish mantle, which can bounce the occasional shot from vehicles of tier 6-8 (don’t expect to bounce shells consistently, however). Despite being built on an IS hull, this thing doesn’t have as low of a top speed (43kph vs 38 on the IS), and although the acceleration is not very good (13.1 hp/ton + somewhat high terrain resistance), this extra speed comes in handy for downhill charges or ramming light vehicles. This tank is probably my least favorite of the quartet despite these advantages, as the accuracy (while improved over the IS’s) is still too unreliable for my style of play, and it doesn’t have the armor to get up close to the front lines in tier 8-9 battles. Still, not a bad tank by any stretch of the imagination. 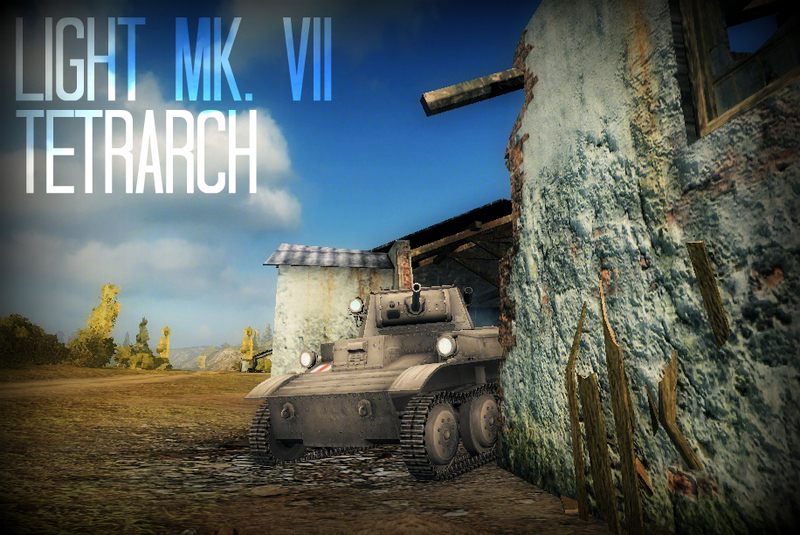 Last (but certainly not least) is another tier 7, this time a Russian heavy tank: the IS-2. Sound familiar? Yes, there’s now 2 IS-2s in the game: the Chinese version and now this. To make things more confusing, they both have the same name in-game, so it can be a little hard to tell the difference between the two. They do share a lot of similarities, including their turret armor profiles, guns, and mobility, but several things have changed. For one, the upper plate armor on the Russian IS-2 is 100mm thick (vs 90mm of the Chinese variant). This might not sound like very much armor, but the front is nicely sloped, making the upper front plate armor effectively ~160mm thick, and angling increases the effective thickness even further. The Russian version also has 80 more horsepower in the engine (600hp vs 520hp), which allows it to accelerate a little faster than its Chinese brother. Beyond that, it pretty much shares the same playstyle with the Chinese IS-2 and Russian IS-1, so for anyone who already played either one of these tanks, the new Russian IS-2 should be easy to adapt to. Overall, I’ve found this to be a much more comfortable tank to play than the ISU-122S, as the added armor, turret, and better hitpoints compensate for the slower reload, worse accuracy, and lower top speed. This thing falls just short of the Cromwell B on my list of favorites from the Berlin Quartet, but it still holds up very nicely for its tier. So, there we have it! Overall, I really do like each and every one of the tanks in this pack (for once). Sadly, it’s not on sale anymore, but if it ever does come back to the shop (although it’s been said before that it won’t come back), I’d highly recommend picking these up. Anyway, I hope you enjoyed the tank reviews! Before you go, I have a quick announcement to make: Originally, I planned on writing a new car review (requested by GeneralRambo) this weekend, but finals are just around the corner, so I’m going to postpone the review until 2 weeks from this Sunday (May 24th). Sorry for the short notice, but things are picking up a lot faster than I expected (oh boy, test stacking, fun). WOT 9.7 FIRST IMPRESSIONS | The cavalry has arrived! The arrival of 9.7 brought many new things to World of Tanks, including a new map (Overlord), another new tier 8 premium tank (T-54 First Prototype), and a whole boatload of bug fixes (sadly, not everything was fixed, but whatever). 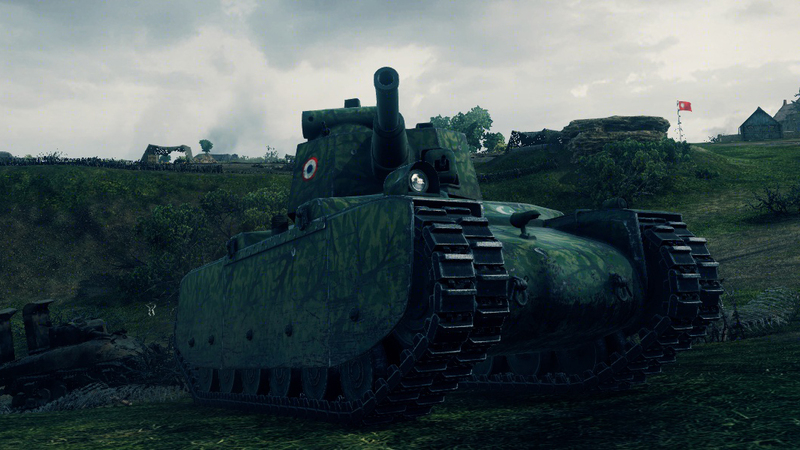 The most important thing that came in this update, however, was a whole bunch of new French light and medium tanks. And oh boy, they're all a lot of fun. The line is a little weird, however; several tier 2-5 tanks were added, but they serve as an alternate line to the ARL-44, and a tier 9 and 10 medium tank were added, but they are researched through the AMX-13/90. A little complicated, yes... but hey, at least we got the tanks in the first place (they were apparently on the shelves for a few years). So, here we go: a review on each of the new French tanks introduced in 9.7 (besides the AMX 30B, as I don't actually have that one yet, and I don't plan on getting it... I'll explain why later. You'll see). If you've ever played the Hotchkiss H35 or Char D1 before, you'll have no problem fitting to the playstyle of these two monsters. 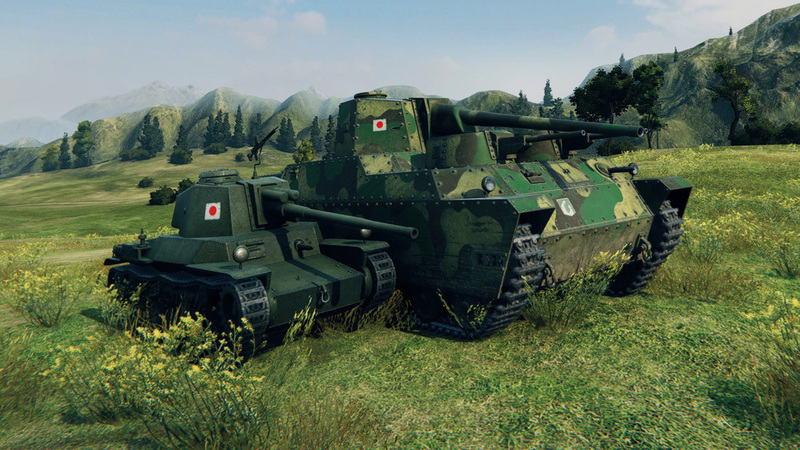 Don't let the light classification fool you; the R35 and FCM 36 are definitely the heavies of tier 2, with very slow speed and mediocre maneuverability, but plenty of armor to match. They also share the same gun selection: you can either mount a rapid-firing, high-pen 25mm with low damage per shell, or a more punchy, 37mm alternative with less accuracy and penetration. So, what's the difference between the two? Glad you asked. To start, the R35 is slightly smaller overall compared to the FCM36 (although it doesn't make much of a difference), but because of this, the modules and crew members are positioned closer together, which makes it easier to knock out multiple modules in one shot. However, despite the decrease in size, the R35 actually has more all-around armor compared to the FCM; you get 40mm at the front and sides, and 32mm at the rear. This makes the tank particularly hard to penetrate, especially if you angle even slightly. On the other hand, while the FCM36 gets 40mm of frontal armor as well, the side and rear armor drops to 20mm. This may seem like a huge problem, but it really isn't: the sides and rear are both angled very nicely, which allows for you to bounce plenty of shots once more. Just below the top plate of armor, there's even a section of 20mm-thick spaced armor covering the top of the tracks, which increases the effective armor thickness to around 60mm due to the combination of the 20mm side, 20mm spaced plate and 20mm tracks. Another thing to note is that the R35 has a total of 155 hitpoints, while the FCM36 only has 140, which makes the emphasis on armor even more important to the survivability of both vehicles. So, overall, despite the low amount of hitpoints, both tanks are pretty damn hard to take down. Next up: the guns! Both tanks have reasonably good gun depression (R35 has -16 degrees, while the FCM has -9 to -17 [!] degrees depending on your gun selection), and the armor penetration values for both the 37mm and 25mm guns are decent for tier 2. However, the 37mm trades accuracy and rate of fire for slightly more damage, while the 25mm gets better penetration and rate of fire, but less damage per shell. I'd suggest using the 37mm on the R35 due to the good gun depression and better all-around armor (it makes trading shots with other tier 2s far easier) and the 25mm on the FCM due to the -17 degrees of gun depression it comes with (the 37mm only gets -9, remember) and the lower hitpoint pool (better rate of fire means you can get more shots off in a bad situation versus the 37mm). 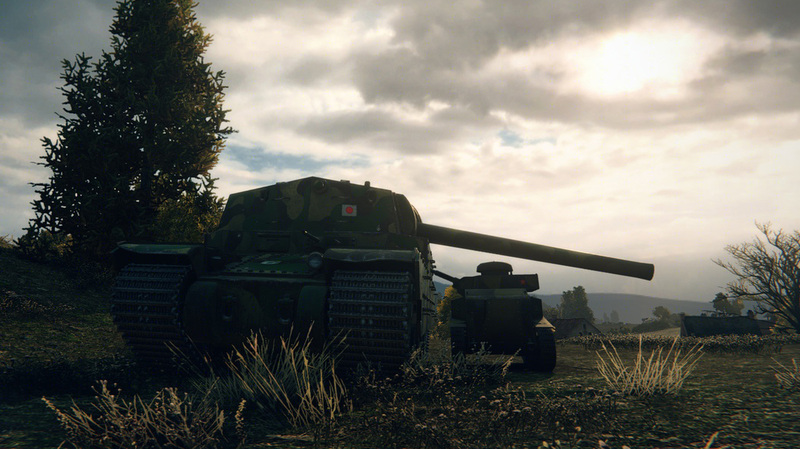 I am definitely going to be holding onto these two beasts due to the reasons listed above as well as their low operating costs (these are tier 2s, after all) and, well... let's face it, they're both incredibly cute for tanks. TWO THUMBS UP! We're only at the tier 3, and yet this is where the line begins to change drastically. Other than its classification as a medium tank (rather than a light), the Somua S35 still has a high rate of fire with poor damage per shell (and pretty bad pen against tier 4-5 tanks), but now, the armor is much less effective against the guns it faces. Sure, it gets 47mm frontal armor compared to the wonderful 40mm of armor on both tier 2 tanks, but... at tier 3? Eh, it's less than ideal, especially when you meet KV-1s (119mm pen) and VK 30.01 Hs (150mm pen). You'd think the ineffectiveness of the armor would justify a huge increase in mobility, but, although the S35 is slightly faster than its predecessors, it isn't enough to give this thing the ability to flank most higher-tiered tanks (which is problematic, as - well, you can probably already figure out why). Overall, this tank is a little "meh" in my eyes due to the fact that it can meet tier 5s, but when this thing gets into tier 3 and 4 games, it can absolutely wreck other tanks with its rate of fire and decent amount of armor. At first glance, this thing looks a little inferior to the S35 - it has 40mm of frontal armor (even though it's a tier higher, it loses 7mm of armor), somewhat slow acceleration, worse traverse speed, and it can see tier 6s now. However, this thing gets one massive advantage over the S35 - better guns. There are 2 competitive options for this tank. On one hand, you can choose to use a very rapid-firing 47mm with great penetration (106mm), good accuracy (.36), very fast aim time (1.9sec), and, in turn, high DPM for a tier 4 tank (1,738 with a gun rammer equipped), but with relatively low damage per shell (55hp). If this doesn't suit your fancy, you can use a 75mm gun with a lower rate of fire, worse accuracy (.43), less penetration (100mm), and lower DPM (1,416 with a gun rammer) but more damage per shell (110hp). Somehow, this upgrade to the gun selection makes this one of my favorite tier 4s, even with its sluggish speed and near-useless armor. Another thumbs up. I feel as though the G1R is having a bit of an identity crisis: it has the side armor and mobility of a heavy, but the gun, frontal armor, and hitpoints of a medium. Annoyingly, the "upgraded" turret on the G1R has only 60mm of unsloped armor at the front of the turret, and the BDR G1's monstrous cupola sits casually on one side of the turret roof, which gives this thing a fairly low camo rating (and makes it easier to hit). The gun itself is a 105mm howitzer comparable to the M4 Sherman's 105mm, although this version has a lower rate of fire, but a higher shell velocity. The gun depression isn't too bad either (-8 degrees), but it doesn't have the turret front to poke over ridgelines like the Sherman does. There's another twist to this, however: the tank has 60mm of all-around armor. Yes, that's right: the front, sides, and rear of the hull and turret have 60mm of armor, which can lead to some hilarious troll bounces. Also, since the side armor is spaced (50mm of spaced armor! ), you can sidescrape very well against tier 5s and 6s. 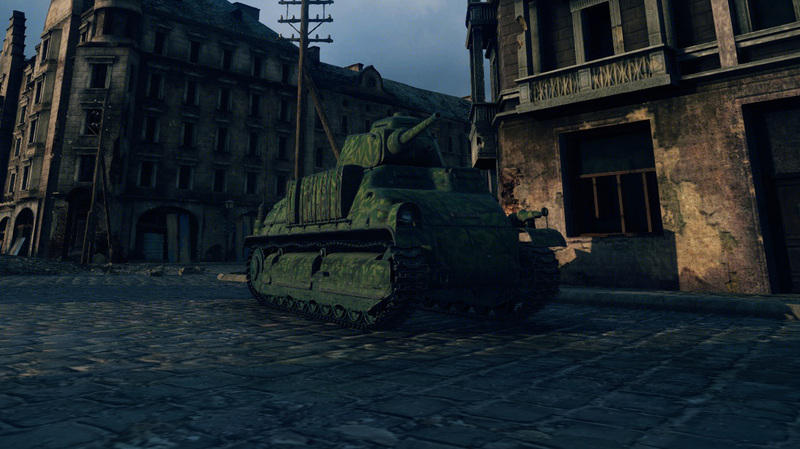 This thing, despite appearing to be a little inferior when compared to the M4 Sherman or Panzer IV H, has proven itself to be a fairly fun heavy-style medium, which works nicely when you consider that this thing leads to the tier 6 heavy in the French tree, the ARL-44. More thumbs up for this one. Remember how I said I wasn't planning on getting the AMX 30B? I'll explain why now. To start, I absolutely love the AMX 30 1er as-is, so I don't see much of a need to upgrade to the 30B. Also, the 30B isn't much of an upgrade anyways: sure, it has a slightly better rate of fire, more hitpoints, and better gun dispersion on the move, but they aren't improved enough to justify its status as a tier 10. Hell, it gains a little weight from the 1er while keeping the same engine, so the horsepower per ton ratio is slightly lower. Will I research it eventually? Sure, as I want to elite my 30 1er. But will I play it? Probably not. Only time will tell, I guess. Anyway, that's it for this post! I hope you enjoyed reading it as much as I enjoyed writing it (and playing the tanks, for that matter). I should have a special article going up either today or tomorrow, so stay tuned for that. The Type 97 Te-Ke was a tankette developed by Hino Motors in 1936. It was used by the Imperial Japanese Army in the Second Sino-Japanese War and WWII, and was intended to be a light and fast reconnaissance vehicle, although it also served as an armored tractor. Around 600 were produced before it was replaced by the Type 97 Chi-Ha in 1944. This thing most certainly isn't fast. The tank itself weighs about 5 tons and the engine only puts out 65hp, so the power-to-weight ratio on this tankette isn't very high (13.66hp/ton). However, this tank isn't too slow either. It's terrain resistance is fairly low compared to tanks like the M2 Light and Tetrarch, and it has a decently high forward speed limit of 42. This thing definitely doesn't work if you play it like a scout (unless the enemy team forgets to shoot at you [which rarely happens at tier 2]). The traverse on this tank actually isn't too bad. It has a hull traverse rate of 44deg/sec. Not bad for a tier 2 tank with a 65hp engine. The turret traverse is also pretty nice (36deg/sec), and the combined turret and hull traverse allows you to deal with anyone who tries to flank you (and fairly easily, too). ...Yeah, you read that right. 4/10. 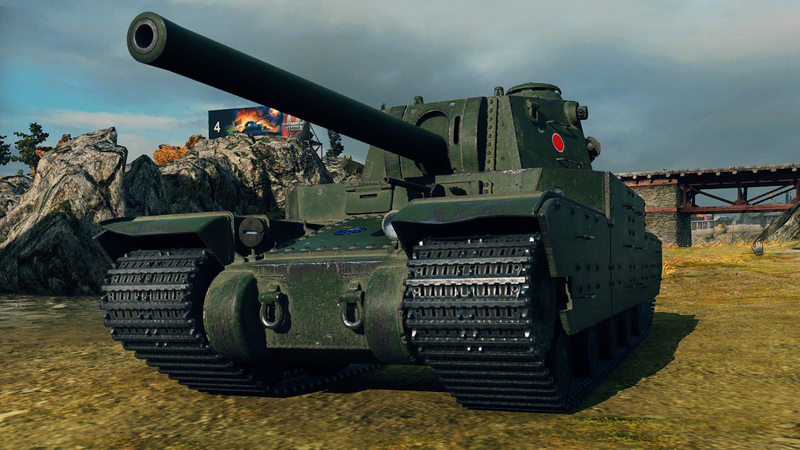 This thing's armor is very similar to other Japanese tanks in the fact that it's paper thin. The sloped part of the upper front glacis is only 6mm thick. Even though it's sloped at about a 45-degree angle, the slope only makes it effectively 12mm thick. To add to the list of problems, this sloped part can be overmatched (no matter how much you artificially angle the tank) by 37mm guns. Even the lower plate on this tank is only 12mm thick at best. This tank has decently high hitpoints (160) for the tier, but due to the bad armor, if you ever get into a situation where you're brawling another tank, you'll probably die very quickly. I really love the gun on this thing. Although it has .4 accuracy, it tends to land most long-range shots if you let the gun aim. Speaking of that, the gun's aim time isn't the fastest (2.2 seconds to aim fully), but it does the job. As an added bonus, this isn't one of those guns that reloads faster than it can aim, and the reload is actually pretty quick (3sec). It has pretty good penetration as well (40mm with regular AP, 60mm with premium AP) and nice damage (45 average) which allows you to tear apart anything unfortunate enough to stumble in front of your gun. Oh, and as an added bonus, the gun has -15 degrees of gun depression and 20 of elevation. Which is pretty phenomenal even by high-tier standards. I'd suggest playing this tank as a mid-to-long-range sniper due to both the good gun and bad armor. This thing's view range is surprisingly good for its tier (300m), which definitely helps it in the sniper role it seems to work so well with. Its radio range isn't too bad (400m, which is 75m better than the T7 Car and Light VIC), but it isn't nearly as good as the 545m of the Tetrarch or the 615m of the M2 Light. However, since you probably won't be scouting with this tank due to the low power-to-weight ratio, the 400m signal range is sufficient enough for most tier 2 fights. This tank certainly isn't bad by any means, and personally, I think it's worth keeping. Besides, it's the first HD premium/gift tank, and in my opinion, it looks too damn cute to sell (yes, I just said that I think a tank looks cute... deal with it). It's nicely suited for maps like Province where you can camp up on your side of the map and snipe any unfortunate enemies who decide to charge down the hill or step out of cover. Even though it has .4 accuracy, it lands most of its shots at range if you let the gun fully aim. The reload speed is great to tear anything apart (even T18s), and it does a decent amount of damage per shell. 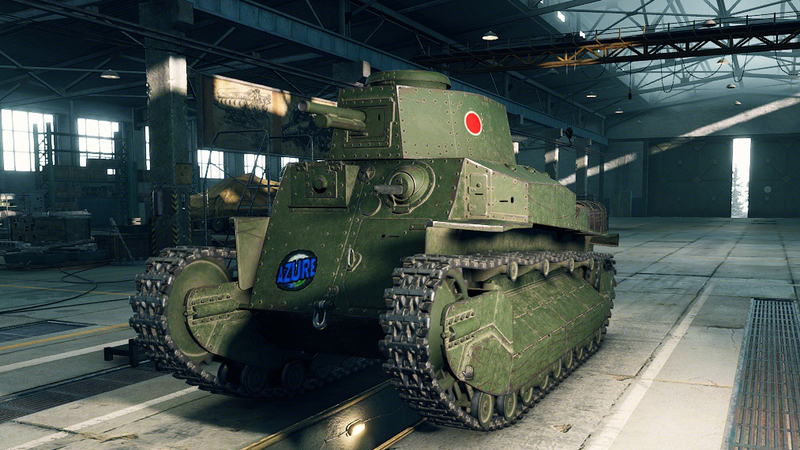 Oh, and since it's considered a premium tank, you can train your other Japanese light tank crews with this. Overall, I think this is definitely going to be one of the few gift tanks I actually keep. Hopefully you enjoyed reading this as much as I enjoyed writing it, and as always: Thanks for reading. This tank's key strong point is its speed. The tank has a top speed of 62km/h, which is easily achievable by the 180hp engine. It's also a very light tank, weighing in at only 7.2 tonnes (hence its classification as a light tank). This makes it a very hard-to-hit target while at speed. The traverse of this tank is actually pretty decent. Even though it may seem a bit sluggish, the straight-line speed of the tank is usually enough to keep you from slowing down through corners. Time your turns correctly, and you can easily maneuver through the narrow streets of Himmelsdorf or the tight alleyways between the buildings of Port. The main weak point of this tank is its armour. The best bits of armour on the tank are only 16mm thick, and the worst points are a measly 10mm thick. This thing can't seem to make anything that hits it bounce. Due to this, I would recommend against stopping your tank to fire while out in the open, as you will be killed very quickly if you do so. The other strong point of this tank is its gun and turret. Both are quite good. 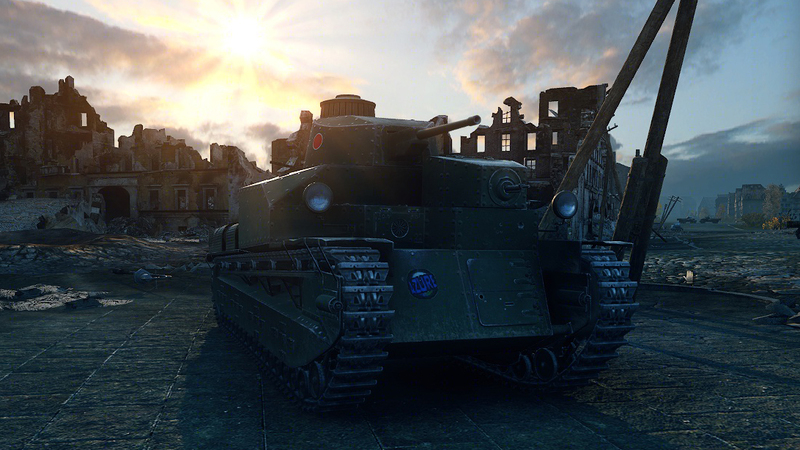 Unlike some other tanks of its tier, the Tetrarch's turret isn't the weakest spot on the tank. The turret's armour (although there still isn't very much of it) seems to be good at keeping the gun and other modules from getting damaged, although I noticed I got hit in the ammo rack on occasion. The turret can turn at a decent traverse speed as well. The tier 4 (yes, you read right, tier 4!) 2-pounder gun itself is nice and accurate (with 75% crew, as tested), especially for its tier. Surprisingly, the gun is also decently accurate while moving. I can only imagine how good this thing's gun would be with 100% crew and a gun laying drive. Finally, the reload time of the gun is not very long (around 3 seconds), so lighting your enemies up with this tank is a breeze. Honestly, this tank is among my top 3 favourite tanks in this game; the other two being the Somua S35 CA and ELC AMX. It's a very well-rounded tank overall, and suits my playstyle nicely. If the armour was any bit better, I'd actually consider this tank overpowered. I'd recommend playing this like a proper light tank: don't stop moving often, dart in and out of cover, and circle enemy tanks at close-range. You'll get quite a lot of kills if you play this tank right. Hope this review is helpful to some of you guys, and as always, thanks for reading! 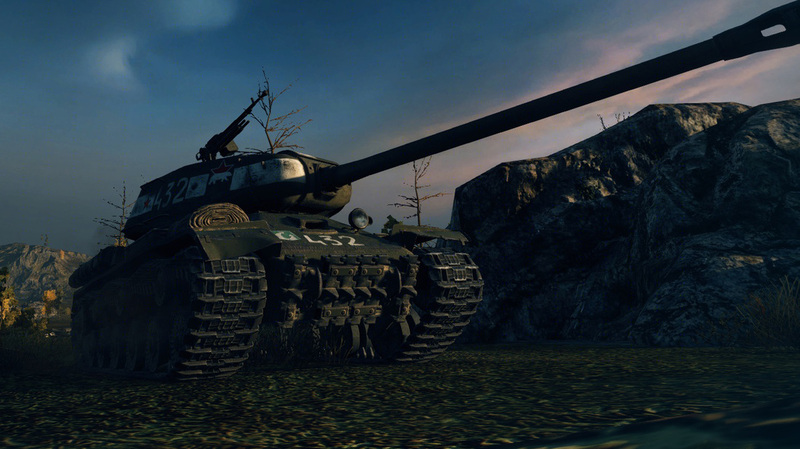 Here, I'll be writing reviews of vehicles from World of Tanks. These reviews will mostly be of tanks from tiers 1-8, as I'm still learning the tactics of the game (even after 8,000+ battles!) and I tend to do better and have more experience with lower-tiered tanks.